Torinus served 20 years as CEO of Serigraph, and now serves as its active Chairman. With compelling detail, he shares how he involved their employees in their own health, enabling them to be effective consumers. It’s healthcare consumerism in overdrive. Five years into the reform, Serigraph spends one-third less than the national average to insure its workers. Serigraph’s approach is the antitheses to the common response of the typical employee covered under their employer’s medical plan, “Don’t worry about the bill, it’s covered by insurance.” “Incentives” don’t quite describe Serigraph’s efforts at engaging employees in wellness. Rather, health is a substantial chunk of the culture. Under Torinus’ leadership, they put in place a plethora of wellness initiatives. Employees don’t have to leave their facilities to meet with a nurse practitioner, dietician or the chiropractor—who doubles as an ergonomics expert. They offer their employees inexpensive access to a primary care doctor. Serigraph promotes a fitness culture that includes walking paths around campus, high-touch health coaching, an onsite fitness center, sponsoring—and encouraging employee participation—in walking, running and biking events. They refer to Health Risks Assessments as mini-physicals, which are free and virtually mandatory for employees and spouses. Their Get LEAN Lose Weight program helps employees to focus on Losing Weight, Exercise, Attitude and Nutrition. Preventive tests, even before healthcare reform, were offered at no cost to employees. Because their insurance is self-funded, Serigraph saw the necessity for extensive cost cutting measures. They have negotiated contracts for common elective and planned medical procedures, utilizing Centers of Values that provide the best combination of service, quality and price. They have put in a place a prescription plan with multiple tiers, with compelling incentives (penalties) for employees to choose generics. Through selected vendors they encourage medical tourism to reduce costs of major procedures, saving tens of thousands of dollars per surgery. If an employee finds an error on the bill from a medical provider, the employee gets to pocket 50% of the savings. The tendency of anyone reading their story is to conclude “we could never do that!” It is true Serigraph’s story is well beyond replacing doughnuts with bran muffins in the break room. However, it didn’t happen overnight. 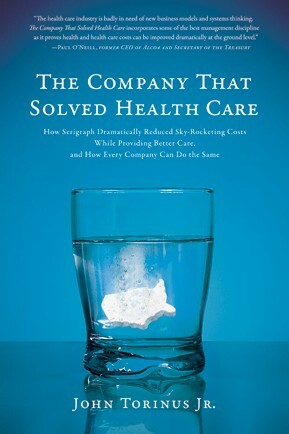 It was a process—a process that included getting top management on board, tracking health metrics and purposefully creating a sense of crisis around the rising cost of health care. Many of the wellness initiatives were voluntary the first year when they began proactively educating their employees on health and the costs associated with health and how those costs affected the viability of the company. Then came the hyper-communication of health and wellness. Torinus writes, “We have used every communication device known to man to say in touch with co-workers.” In addition to monthly newsletters on health issues and information on health disseminated via bulletin boards, company intranet and regular quarterly meetings, Serigraph offers two lunch-and-learns each month on health issues, mandates face to face meetings with health coaches, and the CEO interacts with employees on health related issues via the healthcare blog on its intranet.